Questions are below – please download as a PDF file by clicking this link and fill out and send back to us. 1.1 What is your registered company name and address? 1.2 How long has the above company been trading? 1.3 What is your company turnover per annum (state currency)? 1.4 How many staff do you have (total)? 2.1 What other companies / brands you representing? 2.2 What is the geographic area you cover for sales and marketing? 2.3 What is your experience in the education, child development market sector? 2.4 What major retailers do you supply and in which of the above sectors? 2.5 How many retailers do you supply in total in each of the above sectors? 2.6 Do you handle other products which might compete with or complement SmartChartz? 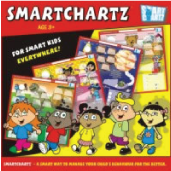 2.7 How would you launch and market the SmartChartz Brand in your territory? 2.8 What other specific industries or market sectors do you specialise in? 2.9 Why do you believe SmartChartz is suitable for your market? And what research have you done, if any? 3.1 Do you have adequate secure warehousing and handling facilities? 3.2 What are your distribution channels? 3.3 What are your usual payment and stocking terms? If CIf from UK what is the best means and cost of delivery to your warehouse? When are you looking to commence taking SmartChartz into your market?